As tourism grows in Asia, there is a responsibility of both the tourist and the country to preserve the country’s history, while weaving it into a future that will move the nation forward. ‘Do you want extra spicy, too spicy or most spicy kimchi?” asks my waiter in response to my request for the quintessential Korean dish. As I look at him in alarm he rolls his eyes and laughs, says “joking” and hands me a roll of lavatory paper to use as napkins. I can’t help but think he is right to laugh at me. There is so much more to Korea than kimchi, and nowhere is this more obvious than in Seoul. Long underrated and overlooked by tourists in favour of Tokyo and Beijing, in the past few years the capital has been undergoing a renaissance. Old neighbourhoods are being restored and preserved, the populace is becoming less homogenous and initiatives to beautify the city and make it more eco-friendly are under way. With its ancient palaces, world-class museums, non‑stop shopping and esoteric and vibrant markets, Seoul has everything to offer but crowds. Lofty words, and while the city has definitely got some fantastically inviting qualities (and certainly more than I expected) from what I’ve seen, the interplay between the past and future is a little more complicated – and interesting – than our guide would have us believe. I’m inclined to think that as modern as it is, Korea is equally enamoured with its past. Indeed, it is this tension that makes it such a compelling destination. While the struggle to preserve Confucian-inspired traditions is strong (on the subway I witness several senior citizens chastising a group of youths for dyeing their hair), so too is the drive to embrace change. In fact, Gyeongbok Palace could not be better placed to offer a first-hand look at what has come of Seoul’s efforts to remain ancient yet ageless. Sandwiched between two of the city’s most famous palaces (Gyeongbok and Changdeok Palace, a Unesco world heritage site) lies Samcheong-dong, one of the city’s most idiosyncratic and engaging neighbourhoods. Long eclipsed by Insadong as the go‑to neighbourhood for Korean immersion, among locals Samcheong has much more authentic artistic and cultural credibility. Avant-garde art galleries and even a museum dedicated to Eros – something previously unheard of in sexually conservative Korea – shoulder historic hanok houses (traditional Korean wooden residences, some of the only examples remaining in the city), modern restaurants vie for customers with hole-in-the-wall diners, and traditional tea gardens still manage to thrive despite the advent of trendy coffee houses. Walking along the narrow, twisted and often unsigned streets (a map is of little use here), I see local teenagers walking arm in arm. “Hello! Where are you from?” they shout at me from across the street. An elderly couple gives a slight bow of acknowledge-ment and smiles as I pass. I take a peek at the popular contemporary Hyundai and Kukje Galleries, before stumbling upon the intriguingly named Seoul Museum of Chicken Art. At first I think there must be a spelling error: surely they mean children, maybe even chocolate? But no, they mean chicken. The museum contains almost every imaginable iteration of the feckless fowl. Only in Samcheong could such a museum thrive (nearby there is also a museum dedicated to owls). Suffering from orbital overload, I find a tea house where, despite my waitress’s suggestion, I skip the deer-antler tea and choose persimmon instead. But the lure of this fascinating area and its architectural juxtapositions is too strong to stay indoors for long. Hovering over the antiquated hanok homes are myriad skyscrapers from nearby downtown – Seoul’s metallic homage to modernity – and the contrast between the two is striking, if a little sad. Nearby is another of Seoul’s unassuming oases where past and present have found a middle ground: the Cheonggyecheon stream. The stream was originally covered by tar and used as an overpass until it was reclaimed several years ago. Now the nearly four-mile waterway is bordered by a verdant promenade filled with bridges, birds, flowering shrubs and trees. It is dug out to several yards below street level, and children’s laughter and birdsong drown out the noise of the bustling city. Stepping down into this bucolic sanctuary, I feel as though I’ve discovered Seoul’s “off switch”. But some things about this city are impervious to evolution, which is as it should be. Perhaps one of the best examples is the Noryangjin Fish Market, where little has changed since it opened in 1927. Not many tourists venture to this authentic seafood market where almost every conceivable creature from the sea is for sale. I load up on coffee and head out just after midnight to witness what I had been told was a must-see event: the fish auctions. Serious-looking men crowd around crates of squid, crabs and shrimp and stare anxiously while scribbling furiously in notebooks. Before the auction begins, I notice scraps of paper trading hands, lots of winking and a few surreptitious handshakes, but everything stops once the bidding begins. Though I don’t understand a word, I am enthralled as bidders and auctioneers huff and puff over prices at breakneck speed and bracing volume. Watching the auction, I work up an appetite, and there is only one thing on the menu at this market. Most of the stalls will cook up whatever seafood you can point to (and pointing is indeed what you will have to do, as almost no one speaks English here). You can eat whatever seafood you like with a side dish of kimchi or noodles or, for not-faint-of-heart-foodie, you can eat your meal live and kicking as the locals do. And I do mean live; one of the most popular dishes at the market is sannakji – live octopus. After the market, I search out something a little more sedate for a midmorning snack and find the perfect stop in Insadong. I come upon the Old Tea Shop which is pretty tucked away but really worth the effor. It’s known to locals as the Flying Bird Tea Shop because of the bevy of feathered friends that flit freely around the interior (refreshingly, Western-style health and safety codes have not caught on in Korea yet but be warned: you may want to cover your tea cup in between sips). This charming shop offers authentic Korean teas such as plum, fresh ginseng, mushroom and quince but it’s the non-paying customers that are the real draw. Dozens of songbirds (some even singing out the occasional Korean word) fly above and even occasionally land on my plate, trying to steal a piece of rice cookie. A rather lovely white finch proves more stubborn than the rest and refuses to fly off, so I relent and give him a piece of my cookie. It’s hard to say no to a creature actually willing to sing for his supper. Korean Air (00800 0656 2001; koreanair.com ) and Asiana Airways (020 7304 9900; flyasiana.com ) offer non-stop flights from London to Seoul from around £700 return. British Airways (0844 493 0787; ba.com) launches a direct flight from Heathrow to Seoul in December. There is a direct subway line (about 50 minutes) from the airport to downtown and airport buses and taxis are also available. Seoul has one of the world’s best and most extensive subway systems – use it to get around the city rather than renting a car (driving is hectic and street signs are unreliable). It is reliable and easy to navigate, and maps, station names and instructions are indicated in English as well as Korean. Seoul has some of Asia’s best street food. Do not leave without trying some. Choices include dumplings, noodles, rice and fish cakes, and every version of meat-on-a-stick imaginable. But you may want to avoid one of the local favourites: silkworm larvae. 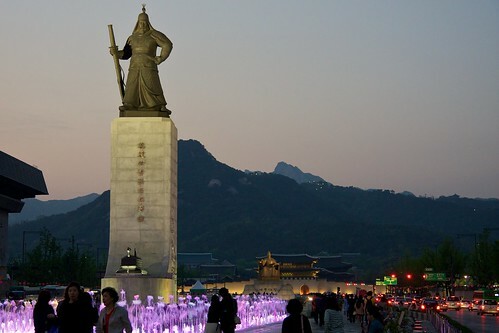 Korea is a highly family-centric culture and is a great place to travel with children. If you are with youngsters, be sure not to miss Lotte World, Seoul’s version of Disneyland, and check out the astonishing COEX Aquarium. Seoul is big on markets. One of the most interesting but least touristy is the Gyeongdong Herbal Medicine Market, with an astonishing array of roots, herbs, mushrooms, teas and other esoteric ingredients. If you’re looking for some nightlife, head to the Hongdae neighbourhood. This area, which surrounds the Hongik University (well-known for its fine arts and design degrees), is the mainstay of Seoul’s youth and indie culture. There is no end of choices for nightclubs and bars – just follow the loud music. Make a day trip to the DMZ, one of the few active demilitarised zones in the world. Tours can be booked at most hotels and will take you to Panmunjom, about 30 miles from Seoul. There, you can see the border that divides the two countries and take photos of North Korean soldiers, who stare unblinkingly forward. It’s a fascinating experience. Korea has great shopping so you may end up buying an extra suitcase to bring home your bounty. A must is the gorgeous traditional Korean celadon, a grey-green-coloured pottery. You can buy it at some markets and shopping centres, but Insadong offers many celadon shops where you can actually meet the artist and get a signed piece of work. The country also grows some of the best ginseng in the world and you can get amazing deals on all things ginseng: teas, vitamins or the root itself. It can be hard to find reasonably priced, well-located accommodation in Seoul but this one fits the bill, located near the charming Insadong area and within walking distance of Seoul’s two main palaces. Rooms are small but clean and comfortable (0082 2 2266 2244; douloshotel.com ; doubles from £60 per night). One of Seoul’s trendiest and most colourful hotels, the IP aims to be funky and even has a set of swings in the lobby for those so inclined. It is in the Itaewon area, which features lots of shops and restaurants, so you will have to take the nearby subway to get to some of Seoul’s more central sites (3702 8000; ipboutiquehotel.com ; from £125 per night). Seoul has no shortage of luxury hotels and this is one of the best. Centrally located, this 34-floor hotel known for its solicitous service, features a spa and large fitness centre with a rock-climbing wall. Ask for a room overlooking the Han river for a jaw-dropping view of the cityscape (00800 1927 1927; marriott.com ; from £170 per night). Located down an alleyway in the popular Insadong neighbourhood, this vegetarian restaurant is run by a former Buddhist monk. A unique dining experience, Sanchon serves a set course of about 20 tapas-style dishes of traditional Buddhist temple foods. At night, there is a Korean dance performance. Reservations are recommended at weekends. Open for lunch and dinner, set menu only. About £15 per person for lunch and £30 per person for dinner (2735 0312; sanchon.com/english/ ). Also in Insadong, this award-winning local favourite offers the best of both traditional and modern Korean cuisine. Diners choose from a selection of set menus, which can change daily depending on what is fresh and seasonal. The meals are complemented perfectly by the setting in a 100-year-old authentic Korean hanok home. Open for lunch and dinner. Meals about £30 (732 2919; edoore.co.kr ). A meat-lover’s dream, this restaurant is one of the best places in the city to experience authentic Korean beef barbecue. In true Korean style, meat is grilled at your table and is accompanied by a variety of side dishes (including kimchi, of course). Open from 11.30am. Meals range from £30 to £40 (415 5522).